QEMU를 통하여 x86/x64 platform의 solaris에서 同 platform을 사용하는 GNU/linux windows 등을 설치하여 동작시킬 수 있음을 많은 web 문서를 통하여 확인하고 있었다. 내가 접근할 수 있는 x86/x64 platform의 solaris는 업무용으로 사용하고 있는 (회사에서 지급한) notebook 뿐이어서 쉽게 시간을 내어 할 수가 없었다. (변명은 언제나 정당한 듯 하지만, 일면 궁색하기도 하다) 지난 주말, 오래간만에 한가한 휴일을 맞이하여 여러 web 문서를 참조하여 나의 solaris platform에 windows를 띄우게 되었다. virtual machine을 타 OS를 동작시킬 때 아주 성가신 문제 중에 하나는 patch 등으로 kernel의 변화가 있을 경우 동작하지 않는다는 것이었지만, windows 2000에 service pack 4를 올리거나 기타 update/patch 등에도 아무런 문제가 되지 않았다. 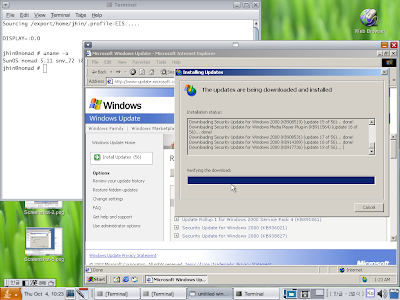 windows xp도 가능하지만, windows 2000은 xp와 동일한 기능을 제공하면서 보다 가볍기 때문에 선택하였다. 이제 windows로 notebook을 booting하는 경우는 없을 듯 하다. 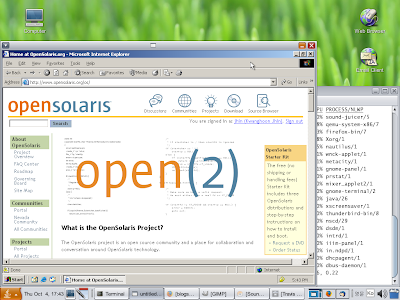 참조 web 문서들: OpenSolaris Project: OpenSolaris support for the QEMU processor emulator -- host and guest HOW TO RUN VIRTUAL WINDOWS XP'S PC IN YOUR SOLARIS DESKTOP WITH QEMU: 위 참조 URI와 동일한 방법으로 되지는 않았다. 나의 solaris는 SunOS nomad 5.11 snv_72 i86pc i386 i86pc이다. fujitsu lifebook s 6311 model을 사용하고 있다. 다음 post는 project home에서 guide한 문서와 실재 설치시 적용되었던 방법과의 차이를 언급하겠다. 좋다. windows로 더이상 나의 notebook을 booting 시키지 않아서!